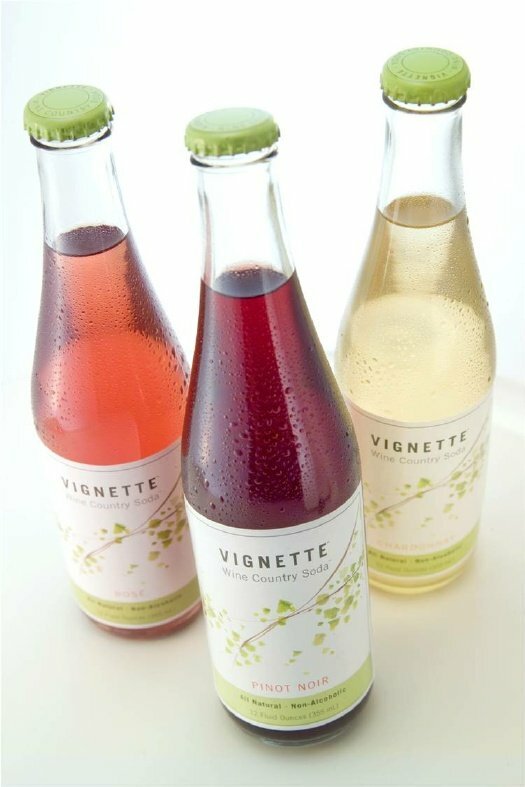 It’s grape juice for grown-ups: With its Wine Country Sodas, Vignette takes the juice of real wine grapes — Chardonnay, Pinot Noir, and Sauvignon Blanc & Grenache — adds a little fizz, and puts it into single-serve bottles. But no alcohol, making them perfect for lunchtime, picnics, or those who can’t (or don’t want to) drink alcohol, but still want to join the fun. The three varieties look quite different but taste more alike than not. The Chardonnay is very light, sweeter than I’d thought it would be (perhaps due to the 31 grams of sugar in each bottle — for comparison, 12 oz. of Coca-Cola has 39 grams), with a taste that really only hints of its origin as a wine grape. Tasting it blind I wouldn’t have guessed it was Chardonnay (since there’s no oak character), but it’s a pleasant soda. The Rosé is a pinkish blend of Grenache and Sauvignon Blanc, similar to the Chardonnay but with more of a fruity punch to it. Again, good, possibly a bit better than the Chardonnay variety but still tasting a lot like a fizzy white wine. My favorite, though, is the more complex Pinot Noir, which is less sweet tasting than the others, and has some interesting wine-like characters, with a hint of the earth that you get with good Burgundy. I liked them all in the end. Definitely give them a try in lieu of a Coke some day!